NETWORK FINALS: THE FLASH and BIG BROTHER: CELEBRITY EDITION gained 0.1 in final numbers, while THE KIDS ARE ALRIGHT lost the same. CABLE HIGHLIGHTS: History’s CURSE OF OAK ISLAND led Tuesday cable, up 0.09 to 0.83, with lead-out PROJECT BLUE BOOK up 0.08 to 0.38. 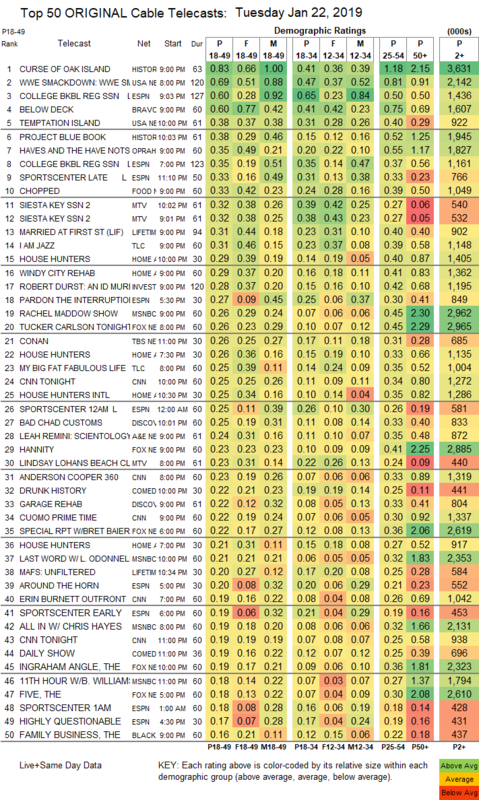 On USA, WWE SMACKDOWN ticked down to 0.69, and TEMPTATION ISLAND was up 0.05 to 0.38. Bravo’s BELOW DECK returned to its normal level at 0.60. OWN’s THE HAVES AND HAVE NOTS dipped 0.04 to 0.35. ESPN’s COLLEGE BASKETBALL game was at 0.35. Food Network’s CHOPPED was steady at 0.33. On MTV, SIESTA KEY aired 2 episodes at 0.32/0.32, and LINDSAY LOHAN’S BEACH CLUB was down 0.04 to 0.23. 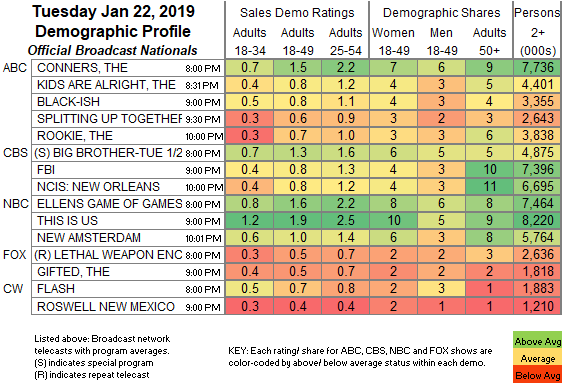 Lifetime’s MARRIED AT FIRST SIGHT edged up 0.02 to 0.31. On TLC, I AM JAZZ jumped 0.12 to 0.31, and MY BIG FAT FABULOUS LIFE ticked down to 0.25. On HGTV, HOUSE HUNTERS gained was at 0.29/0.26 compared to last week’s 0.25, WINDY CITY REHAB climbed 0.03 to 0.29, and HOUSE HUNTERS INTL ticked up to 0.25. On ID, ROBERT DURST: AN ID MURDER MYSTERY was at 0.28. It was a tie in cable news, with MSNBC’s RACHEL MADDOW SHOW at 0.26/0.45/3M, and Fox News’s TUCKER CARLSON TONIGHT at 0.26/0.45/3M, and with CNN TONIGHT at 0.24/0.34/1.3M. TBS’s newly slimmed-down 30-minute CONAN was at 0.26. On Discovery, BAD CHAD CUSTOMS lost 0.04 to 0.25, and GARAGE REHAB was down 0.07 to 0.22. A&E’s SCIENTOLOGY & THE AFTERMATH dropped 0.06 to 0.24. On Comedy Central, DRUNK HISTORY slipped 0.02 to 0.22, and CORPORATE ticked down to 0.13. Freeform’s GOOD TROUBLE was down 0.02 to 0.14. TV Land’s TEACHERS rose 0.03 to 0.11. Tru’s ADAM RUINS EVERYTHING fell 0.06 to 0.09.